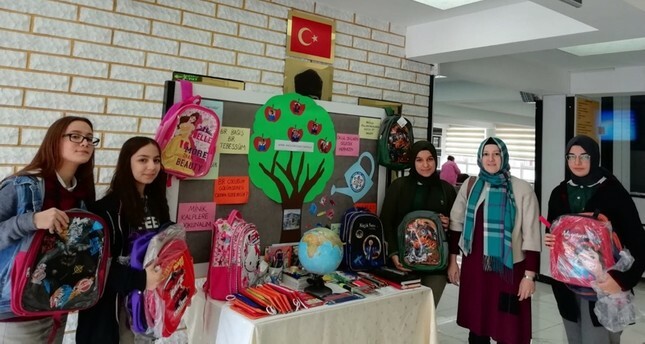 High school students in Turkey's Amasya province have been collecting school supplies to donate and send them off to a primary school in northwestern Syria's Afrin district to mark November 24 national Teachers' Day. The teachers of the Macit Zeren Science High School in Amasya initiated a project to meet the needs of the students in a primary school in Rajo town of Afrin district in war-torn Syria. They encouraged students to buy school supplies for their Syrian peers instead of buying Teachers' Day gifts, as part of a social responsibility project. The Turkish students and teachers are planning to meet the needs of some 40 students at the Syrian school. Speaking about the project, one of the volunteer students said that the best gift to give their teachers is to help their brothers in Syria. The aid packages will be sent to Afrin immediately, School Principal Ahmet Eren said. Between August 2016 and March 2018, Turkey conducted two successful operations in northern Syria, Operation Euphrates Shield and Operation Olive Branch, along with the Free Syrian Army (FSA) with the aim of eliminating the terrorist threat along the Turkish border by cleaning the region from the PKK terrorist organization's Syrian affiliate the People's Protection Units (YPG) and Daesh terrorists. The normalization process in Afrin district of Syria's northwestern Aleppo province has accelerated after Operation Olive Branch. The return of Syrian refugees to their homeland increased significantly after the successive operations. Overall, more than 160,000 Syrians have returned home through border crossings.